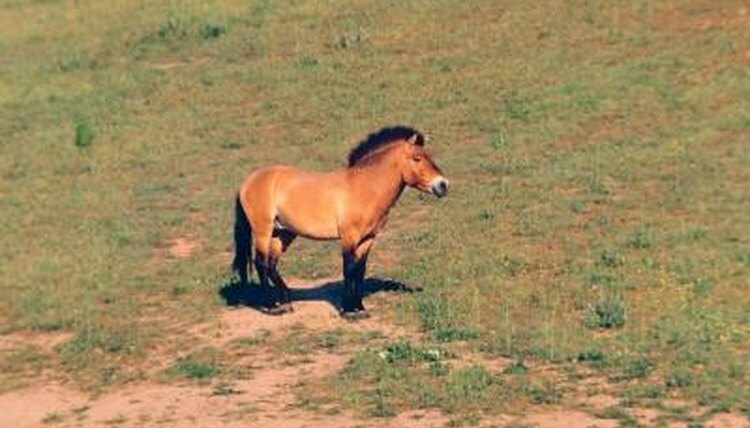 The Mongolian wild horse (Equus caballus przewalskii), which is also commonly known by the name Przewalski's horse, has the distinction of being the sole remaining wild horse species on the planet. These undomesticated horses, as their monikers express, are native to Mongolia, which is a vast nation in the central and eastern regions of Asia. Mongolian wild horses are grayish-brown to brown in coloration, and have lighter-colored stomachs. These equines have noticeably big heads and sturdy, compact bodies. Food-wise, Mongolian wild horses are herbivorous and eat mostly tall grasses, although they do also consume buds, foliage, bark, fruit and rough-textured plants. These horses roam around in social herd units that are made up of female and male "leaders," various other fully mature female horses and their young. Mongolian wild horses live in Mongolia's Altai Mountains, indicates the University of Michigan's Animal Diversity Web. However, throughout history, these wild horses had a significantly bigger geographic scope. Around the latter 18th century, Mongolian wild horses lived all over Europe and Asia, including in the northern region of China, Kazakhstan, Russia, Poland, Lithuania, Belarus, the Ukraine and even Germany. They were last spotted in the wild in 1969, although due to captive breeding programs, some have been reintroduced into Mongolia, where about 306 of them still reside, according to the IUCN Red List of Threatened Species. The introduced horses live in the same types of habitats as their predecessors. The natural habitat of the Mongolian wild horse includes plains, shrubland, grassy deserts and steppes. Mongolian wild horses have inhabited regions as high up as 8,000 feet, however. Due to livestock grazing, many of these horses had no choice but to take up residence in semi-desert environments with scarce water. Mongolian wild horses do not live only in the wild. Approximately 1,500 Mongolian wild horses are alive on the planet, indicates the National Geographic. Many of them live in captivity in zoos all around the world, including in the United States.